Our delivery charges start from £1.99 for smaller and lighter items and will be sent with either Royal Mail Second Class or Hermes 3 to 5 day delievry. If you require an item urgently please call as we can sed items by First Class at an additional cost. 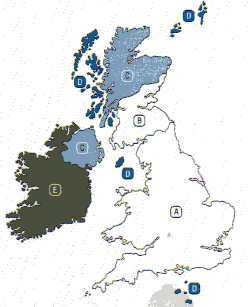 Larger or heavier items will be sent with UK Mail at a cost of £5.99 per parcel up to 30Kg or the volumetric equivalent for the mainland of the UK surcharges will apply for certain post codes, for full details see the map below. If you have selected an item that is out of stock we will notify you by email and let you know when we expect to have the item back in stock or if you would prefer a full refund will be offered. The majority of our goods are despatched direct from warehouse normally within 48 hours of an order being processed. Currently our average time for delivery of goods is 2 to 3 working days. If you have not received your goods within 14 days of your order acknowledgement, and Kingstown has not contacted you regarding any delay, please contact us on 01268 521974 or by email at info@kingstown.net. Kingstown cannot be held accountable for late deliveries if the parcel has been dispatched in accordance to our terms - after this point we are in the hands of our couriers who we have found to be the best available. If you are not home when a delivery is attempted a card will be left with a consignment number and telephone number for you to call and re-book a suitable delivery date and time. In the unlikely event that you should receive damaged or faulty goods, please email info@kingstown.net giving your full name and address, original date of purchase, & Paypal registered email address.